Any day that starts in a warm bed listening to race cars warming up can't be all bad. Follow that with breakfast still listening to the cars with sun pouring in through the window even better. Having spent the whole of yesterday siting in the van in the rain, the wind at the top of the grandstand didn't seem so bad. That being said I am glad to be back in the van with a cup of coffe and my slanket. We've had pretty good racing today, though not as much as they had hoped. Unusually it was the promods causing trouble. The car in the picture behaved fine, after it things got intersting. One managed to not only crash into the christmas tree (the stand of coloured lights that start the races) but also ripped out it's stand, wiring and the timing reflector in front of it. 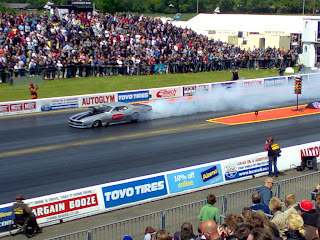 It was folowed by a spate of near misses. People not quite running into each other and the walls. The timing reflectors down the track weren't so lucky and several didn't survive the day. The van has proved a success. We did discover the leisure battery isn't charging but it's not been a huge problem. We needed two reading lights in the over cab area, which is fine as I happen to have bought two, and we found the coocker not only works but works well. I think we will need to get the bathroom sorted for longer stays and I may add a hand cranked sewing machine to the onboard kit. I also tested my zippo handwarmer. It's amazing. If you do suffer from cold hands (or want a traveling hot water bottle) consider getting one. They will stay hot for up to 12 hours and are rather beautiful as well. My coffee is almost gone. Tet is winding up the vans legs. I guess it's time to head home and back to work. It's great to have found a simple way to have a break from work. It's a bank holiday weekend. 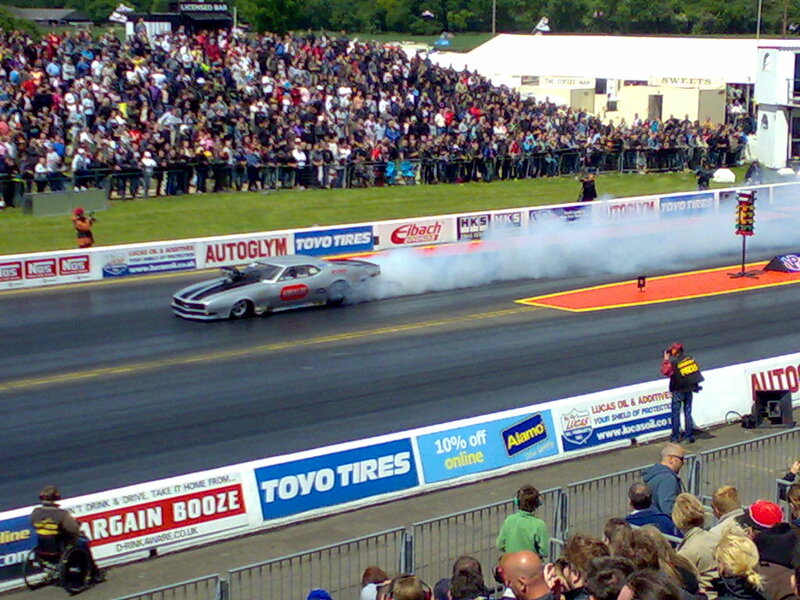 One of the biggest UK drag racing meetings is on and it's raining. It's been raining all day, so no racing so far. However we did manage to insure the van so we have somewhere dry to sit, eat and sleep. It's a lot more civilized than sitting in the car. It also means I have room to sew. This is my first van project. Royal Treasure is another Starr Designs project that I bought at the festival last year. It was simple to pack so it's what I am doing. As you can see I have all the pieces cut ready to start sewing, which means I need to brave the mud and rain to get the generator running. Wish me luck and hopefully Murphys law will mean racing starts just as I get it set up. I just want my vehicles to be legal. Is that such a big thing to ask? I try very hard to be totally honest with my insurance company. I explain exactly what I need and I try to ask every question I can think of to cover things they may not be thinking about. I run a business so I have to have business cover. I don't mind paying for this but when I have I want to know it's all legal and correct. In the process of trying to insure the van, I've been tolds twice that the cover I think I have for my car is, impossible, invalid or not what I thought was sold to me. So I now have to track down the policy documents, go through them again (I do it when they arrive so I am surprised with the claims the broker is making) and find out if I haven't actually been covered the last 3 years. How am I meant to do this? I am quite sure I told them what I needed and what I was going to do. I tried to spot potential problems and I am still possibly not covered. If we had takend the van policy we were offered 2 days ago that would now not be covered either. Despite us giving all the correct information. How many people are being caught out. Oh and I now get to phone two friends to suggest they check their policy too as thier brokers claim to have never offered the insurance they think they have either. Great. I love days that start like this really I do. Yay, it seems I have managed to be insured. Not as well as I thought, but I've hit the legal minimum. Stressed, OH YES! I have been meaning to write an update for just under a week now, but somehow it hasn't happened. Last week was mad busy, but also very enjoyable. After my two regular classes on Wednesday I legged it over to Southend for a talk. I made it with time to spare, much to everyones surprise. Of course that was just Murphys law, I had been offered dinner before my talk and if I had agreed to it you can bet I would have been late. 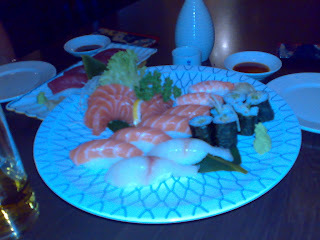 Still we got a very warm welcome and lots of good advice on places to eat after the talk. I was really appreciated and very nice to drive home full and relaxed. Thanks guys. 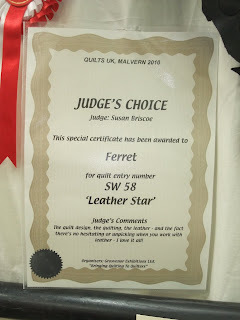 The weekend was just too hot for me to do anything sensible, and trying to quilt half a cow of black leather isn't sensible. I gave up part way through Saturday as I was far to ohot to concentrate and it is n't the place to make a mistake. So instead I got to spend time looking after the vehicles (new plugs for the car and a clean fridge for the van) and playing Rockband. I have discovered drumming is very relaxing whcih is just as well. Monday I quilting my half a cow and a non challenging customer quilt. I now have a slightly more challenging one loaded. It's not going to be hard to quilt but the quilt won't tell me what it wants. It's quite frustrating. If all else fails I will just start and see where we go. 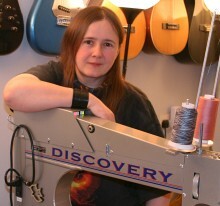 This customer is also a friend and will like pretty much anything I am happy with which makse things a lot easier. The customer quilt I really want to get to work on I am waiting on a backing for, but I think waiting will just make it all the better when I finally get to do it. On the grumpy front I have been trying to deal with banks and insurance companies. It's not big it's not clever and it certainly isn't as much fun as quilting. I think I might finally be making some headway, but it's really been a lot more work that it needed to be. I just hope it sorts out soon and I can forget about it for a year. Well until the next vehicle needs renewing at least. You may be aware I have some computer issues. I tend to feel that computer patterns are unsympathetic to hand made quilts. No matter how good the piecer is, the straight lines aren't. Fabric is a very badly behaved material, it wriggles. Unfortunately computers do straight lines and it can really show up the less than straight piecing. 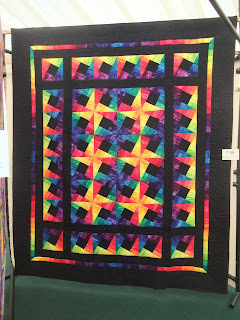 This quilt caught my eye at the show. 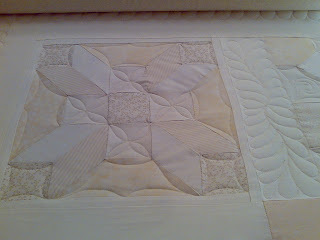 It's a lovely small quilt, but really it was the quilting that struck me. 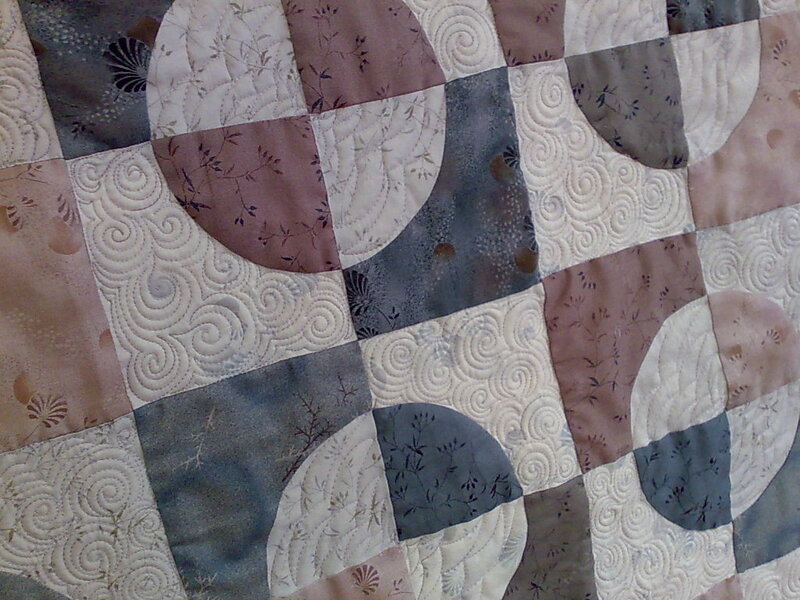 The quilting just works so well on this piece. I love that it really plays to the strengths of the computerised system. The circles in the quilt would be a pain to do hand, and franky circles do look much better perfect. I would not have attempted this design, I know it would have been very difficult for me to do and I could not have got it looking this good. 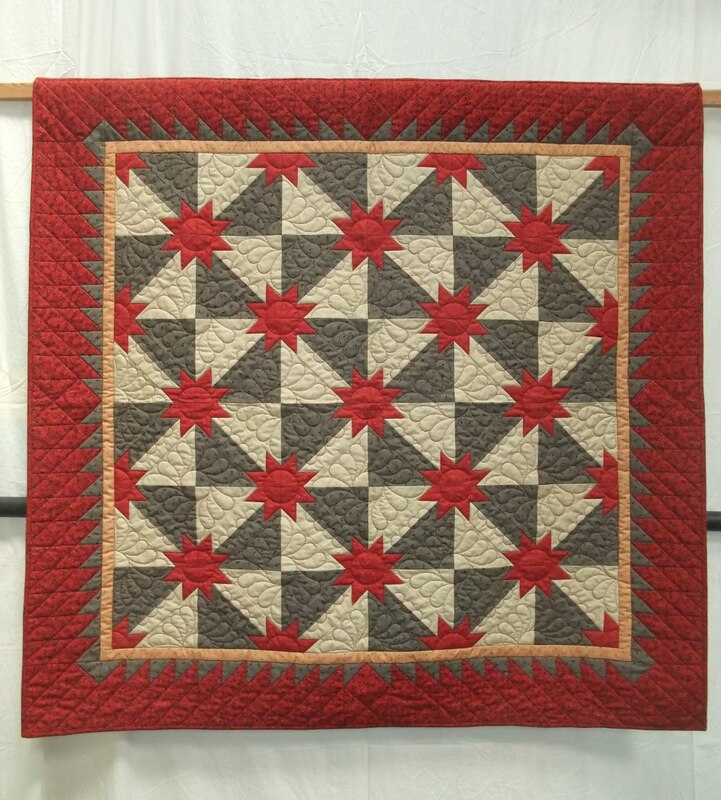 This quilt was made by Sue Watters and quilted by Rosemary Archer of Frome Valley Quilting. Thank you to Rosemary for giving me permission to show off her lovely work. This is the first of our quilts at Malvern this year. I say our as this one isn't mine, it's Tet's. This is his first quilt which was made to test my book. He had promised to edit the book for me, and boy did it need it. Ever seen the unedited writings of a dyslexic? He has. After reading and correcting a large section of the book he realised he what he was doing wasn't really going to check the book. He needed to follow the instructions too. Of course if you follow the instructions in a quilting book you should end up with a quilt, and as you can see, he did. Next we have Leather Star. I nearly didn't enter this and even after doing the forms I very nearly forgot to send it. I had the boxes sealed before I realised I was missing a quilt. I'm very glad I spotted the error, as it came third in it's class. 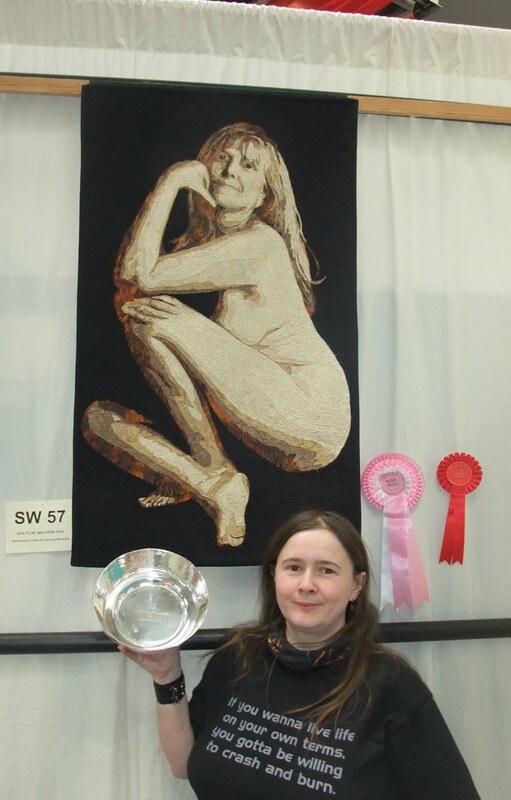 It also collected a judges choice from Susan Briscoe. I was amused to find that she had checked it was really a quilt when judging it. It is. It has one layer of 80/20 wadding in it and a batik backing. 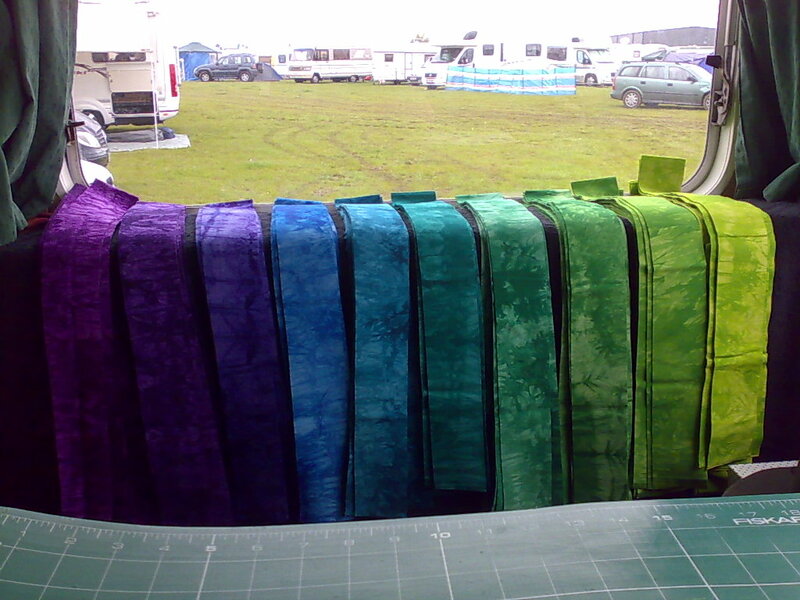 I am very keen for all my quilts to be true quilts, as traditional as I can get them whilst pushing the boundries. I was also pleased to see she really gets leather. Her comments are in the image below. I think the risk is part of what I really enjoy about working on leather. It is scary. Really really scary, but very wonderful too. I know one day I will have a piece go wrong, and I will have to throw it away, but it's a risk I am happy to take. I love working on leather and I can't wait to get to the 4 half hides I have just waiting for projects for the NEC. Remember you can click on any of these images to see a bigger version. You should be able to see the detail of the stitching and read Susan's comments if you do. I suppose this is a good point to comment on judging. I used to think that maybe judges really didn't know who's work they were looking at, but as I've gone to more shows I know I can recognise a lot of peoples work. I also know I am terrible at remembering names, so if I can do it other people can. 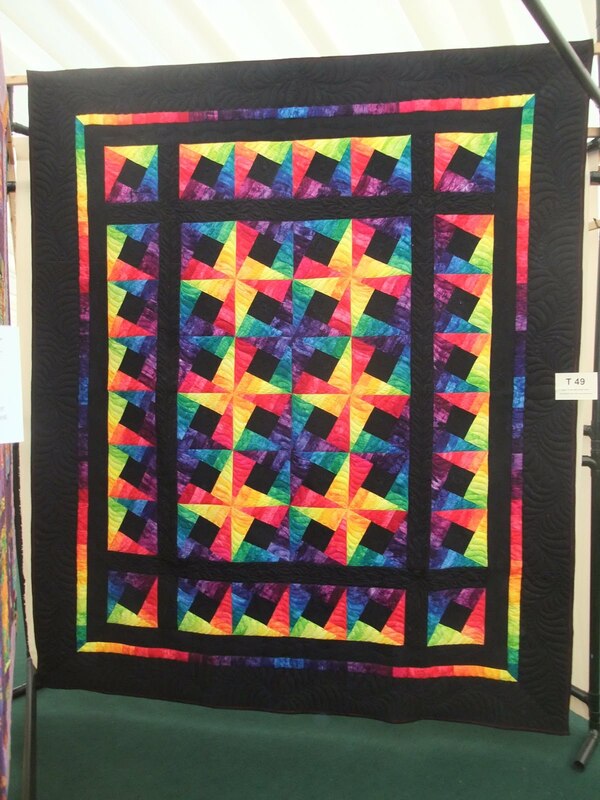 I have only judged one quilt show. It was a fantastic experience and very enlightening. You really can judge impartially if you want to. A good judging form helps too, as it gives you a list of technical items you can consider and give marks too. 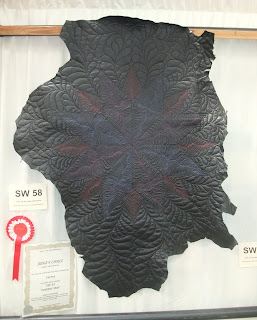 It can mean that a quilt you really don't like gets an award based on technique. I'm not going to tell you it's perfect or always fair, but it's possible. I have now had the chance to talk to several judges, and that seems to be about what they say as well. Some say it is harder to be impartial about techniques they really dislike, but they try. Do they know who made the quilts they are judging? Yes, often they do recognise the style. However sometimes they can be mistaken and yes, sometimes they haven't read the book a given quilt has been taken from and not credited too. Does this mean I agree with all the judging decisions? Nope, and I doubt I ever will. Especially where the judging sheet is used (yes I did just say they are a good idea). A quilt may score well on the items on the sheet, but not push my buttons an overall winning quilt. There is still luck here. I've heard more than one judge say how thrilled/disapointed they were by which quilts came out on top in a category they had judged. The judge doesn't always know how the results will pan out. I have a suspicion it also depends on how much they need food drink and a loo break as well but I can't get anyone to confirm or deny that. It also has a lot to do with why I place a very high importance on a judges choice award. It is the one award they realy do have absolute control over. 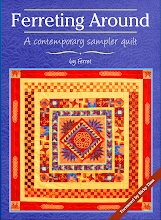 I did notice this year a lot more people were giving full credit to the books, patterns and kits that inspired their quilts. I can't begin to tell you how much that means to me. 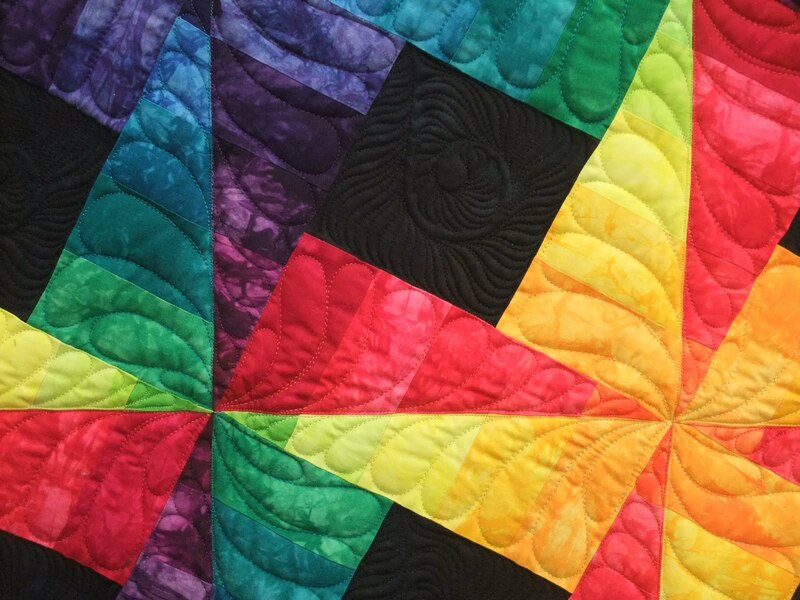 It's lovely to see so many quilters sharing the glory with everyone involved it the quilt. I hope it will continue, and that it might inspire visitors to the shows to try similar patterns. 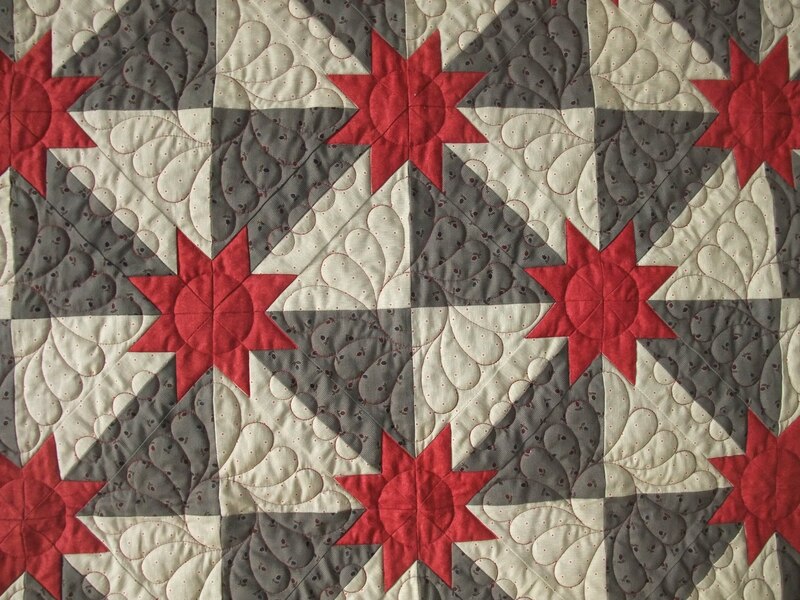 Here is my quilt based on a kit by the Starr fabric company. They call their version Starrfire, and as I made mine for a holiday after the Festival of Quilts last year mine is Holiday Starrfire. I had been looking at the kit for a while but talked myself out of buying it because it was too small. It was only supposed to be a twin. I have a kingsize bed and I wanted a quilt I could use. Eventually it got too much for me. I had to have the quilt. I bought the kit and worked on ways to extend it. Everywhere I have black fabric there was supposed to be a raspberry fabric. 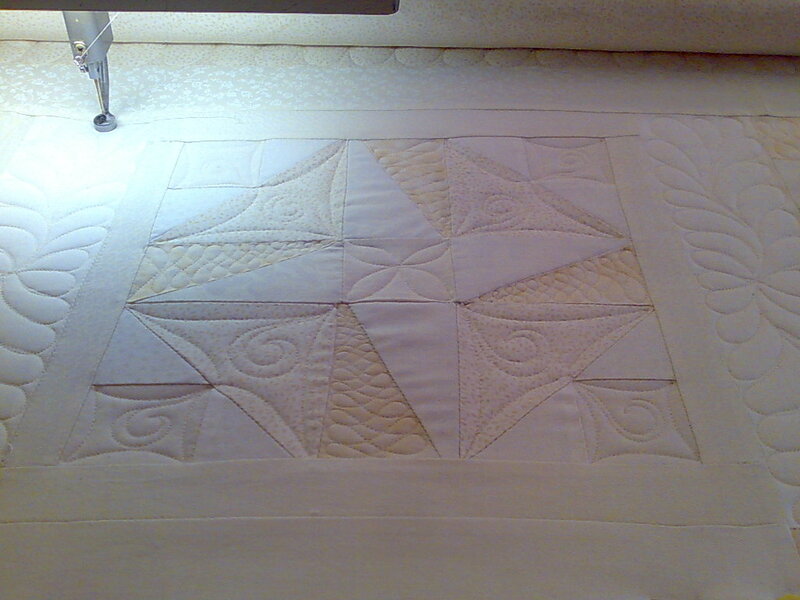 I only had the correct amout of that so I couldn't use it (it is in the binding of the quilt). 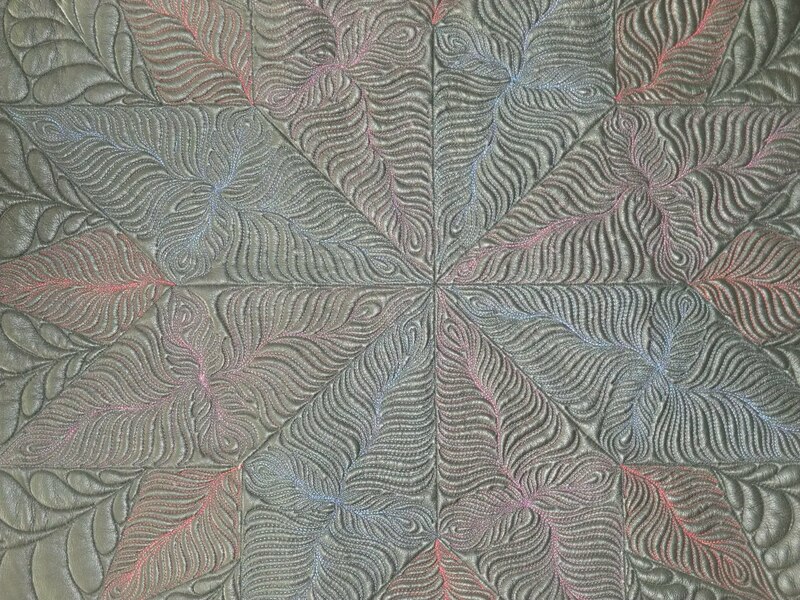 I thought balck would make the colours really pop and I had a lovely batik that would suit the hand dyed fabrics. The internal sashing bars are about twice as wide as they should have been, as is the narrow black border. The quilt should have ended there. Fortunately there were enough scraps of the bright fabrics to make another narrow border, then I was able to add another wide black one. I think the coloured strip stops the quilt looking too much like it has been extended. Without it the outer border would have been huge. I had intended this quilt to go straight on the bed. Tet felt it aught to see the sights before it settled down, so if you missed it at Malvern keep an eye open for it at Sandown next year. I don't know if you remember, but earlier this year, this quilt was penalised for bad applique technique. I think I am supposed to satin stitch over the edges or something, which would ruin the effect, so it isn't going to happen. Anyway, that trophy and the pink ribbon are the award for machine applique! Yay! At least some judges get it. I suspect you can guess how pleased I am. The red ribbon was a complete surprise. It's a judges merit award. 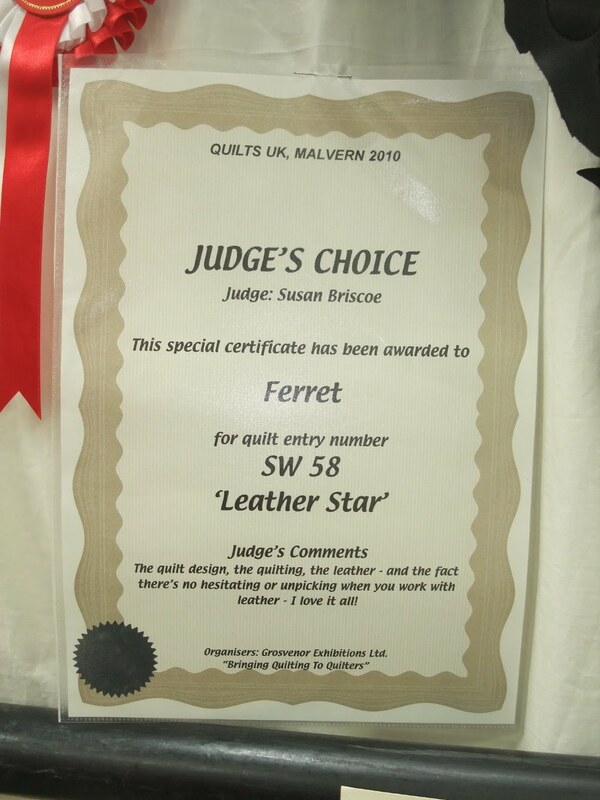 I had no idea I had won that and actually thought it was a ribbon for the judges choice and had been put on the wrong quilt. Not so. It really was a bonus extra. Finally Greek Fossils. As you can see from the picture, this quilt was well recieved. The trophy is the Fran Jones award for stand up quilting. It's a very special award to me. Fran went out of her way to get me started in longarm quilting when she was really ill. I hope she would approve of the quilt. I know she used to check every quilt the judges chose for her award. One of the red white and blue awards goes with it. The other ribbon is for coming 2nd in the large wall hanging category. However below the ribbons is the other (to me) really important award. It's Judges choice from Sandy Lush. 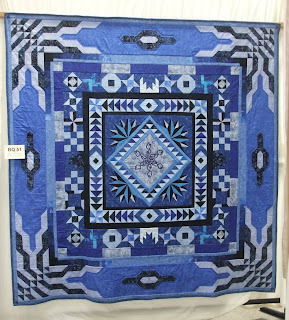 I am so flattered when hand quilters appreicate my work, especially wholecloth quilts. 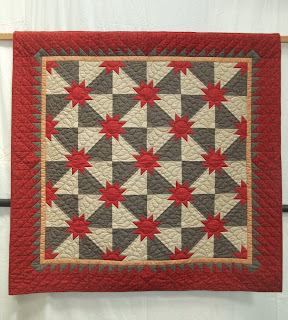 I think the more traditional hand quilters get wholecloth quilting in a way that misses most others. For her to say it's good means a lot to me. This post has got rather long, and I've now finished lunch so the frame is calling. I am so desperate to get the quilt on the frame finished. 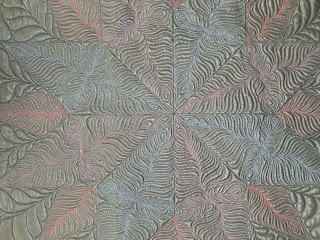 I want to start working on my leather that I bought last week, but I can't until I clear some more customer quilts. ARGH! It's good to be busy, it's great to be able to pay the bills, but I want to play now. The Quilt Show, as in Ricky Tims and Alex Anderson, is offering discounted memberships at the moment. It's 20% off and they are just launching classes with Jan Krentz and Patsy Thompson as well. It seemed like the sort of thing I should share. So if you feel like giving it a try the offer is here. 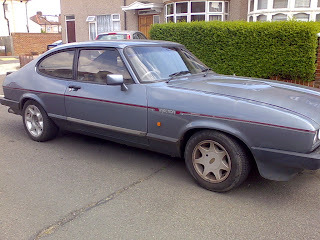 I was asked by some quilters for a picture of my car so here he is. he's a Ford Capri 2.8i, V6. I've always driven Capris, initially because it was what[ was available for the right price, but later becuase I love them. They are a lot of fun to drive, and you can fit an amazing amount in them. I thought while I was at it I would share the newest member of the family. 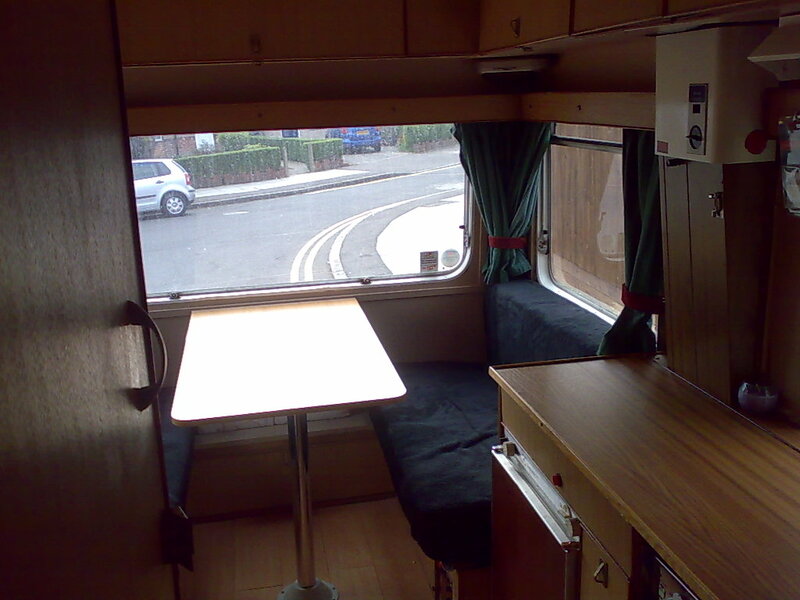 A Bedfors motorhome. It's not the newest or most spacious vehicle, but it should do what we need. It will make my longer tours a lot easier to arrange and work, and even long drives home after talks will be easier. I might even be able to give up motorway service food. When I do a lot of bookings I do get really sick of the good you can get late at night. I suppose I could even eat before the talks. That would be amazing. I suspect as we get time the van will get renovated and repainted, but for now it will do. I haven't had much time to blog recently given a very full teaching schedule. I am managing it now as I am on the tube delivering quilts to a customer. I've been at Patchwork Corner the last 3 days and tomorrow I will be teaching at Connecting threads. 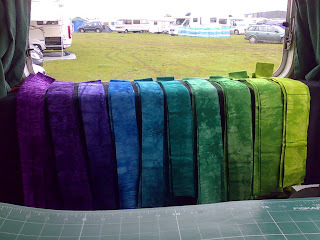 Sunday we will be heading up to quilts UK at Malvern. Tet entered his first quilt there and there are also 4 of mine to be collected. Despite me saying I never win there, I have! 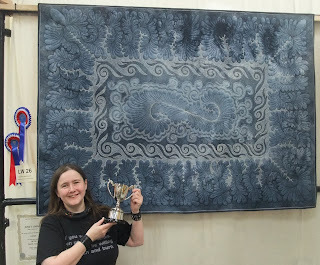 I need to be at th prize giving on Sundsy for Greek Fossils (Longarm quilting award) and Mother (Machine Applique award). The award for Mother is especially welcome, as it was judged in a recent show to have very bad machine applique. It just goes to show, judging is not a science. It is very subjective and therefore somewhat relient on luck. You have to get the right judge on the right day for the right quilt. Of course, if you don't enter that won't happen. So give it a go. 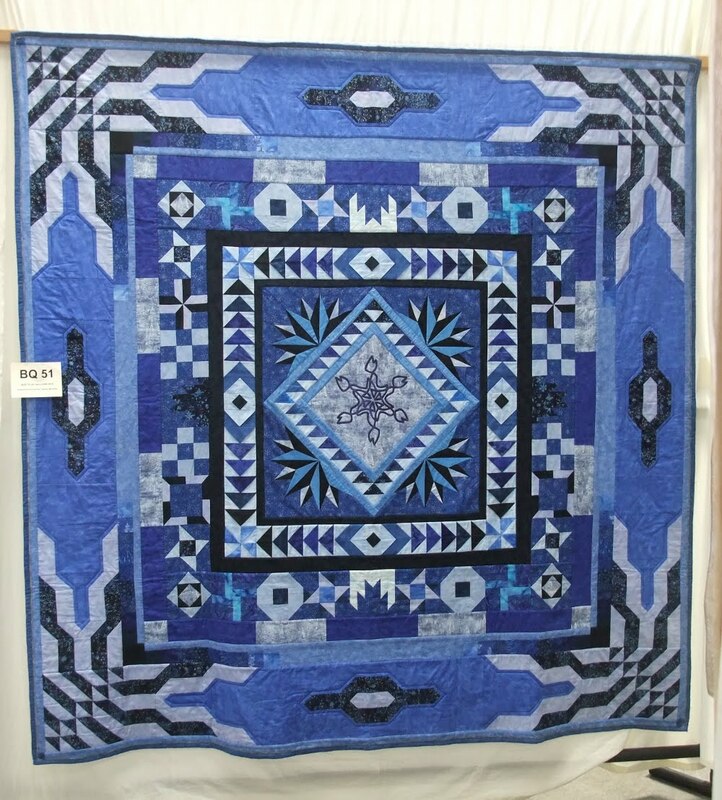 You never know your quilt could just be what the judges are looking for. If you see me at Malvern do come up and say hello. I don't bite often honest. Also if there are things you want to order from my website I am more than happy to bring them to the show with me. Just let me know today or tomorrow. This is the customer quilt I am currently working on. It's a very subtle sampler quilt in shades of cream. I like working on samplers as I use a lot of different techniques on them and they really make me think. This one more than most. I can't change the colour, I have to work entirely by texture and try to make the design of the blocks really pop. I think it's coming along really well. I just hope the customer agrees with me. I am currently on myway home from the last part of my Ferreting Around class at the Wandering Line in Purley. We have come so far from the first class. Ithas been wonderful watching the quilts and the students grow. I'm going to miss them. Hopefully we will be able to reunite for another course soon. I hope they will all send me pictures of their quilts when they are done. My trip down this morning was by train. I blew a radiator hose yesterday and I didn't have time to fix it. My journey home though is in our new toy. 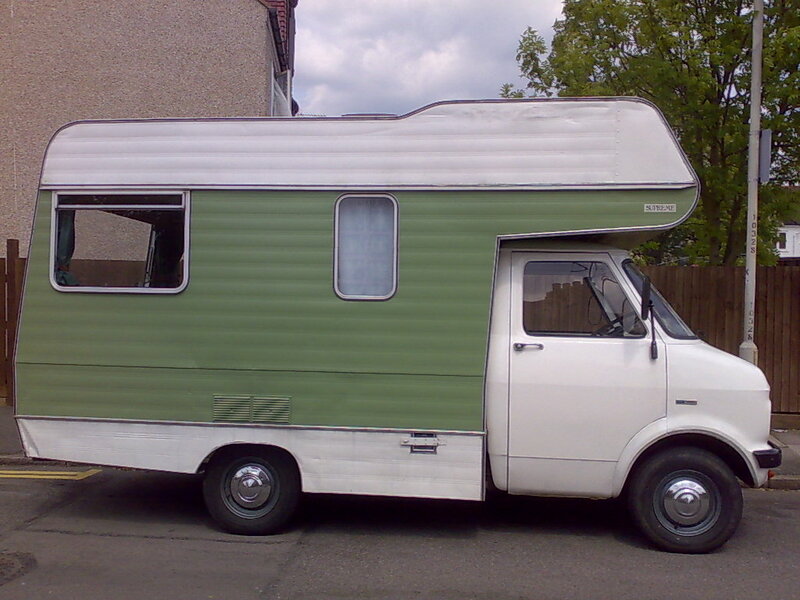 It's a small, elderly motorhome. I haven't had a look round yet but it seems to meet my requirements. It's basic but has a bed over the cab and will save me needing hotels. It is very loud. Probably due to the short exhaust pipe. I am looking forward to making textiles for it as soon as I have time. This is my class project. One of my regular classes felt I sat around too much and that I should be sewing. This is what we came up with as a project for me. It is something I've been wanting to do for a while so I don't mind. I did get a little delayed whne my fabrics were held up by the ash, but everyone agrees they were well worth waiting for. Of course being me I read the 'rules' and immediately decided to break some of them. I also managed to not read one of them (I suspcet I read it but forgot it actually) so my quilt is a bit more challenging than most. What's new? I wonder can anyone spot the deliberate and accidental changes? Following my example two (probably three soon) students are having a go as well. They have both gone smaller than me. I am planning a 100" finished quilt, they are working on 40" and 38". 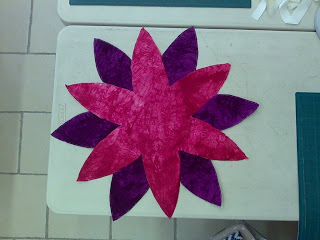 This will use less fabric, although so far mine is using a lot less than I expected, but I don't know it will be easier. I think I have more room to fudge things. We shall see. Well as it turns out customer quilt. Unless you were very quick. It turns out the pictures of the other one weren't very good. About typical I guess. At least this is the quilt I liked better. I returned several quilts over the last couple of days. 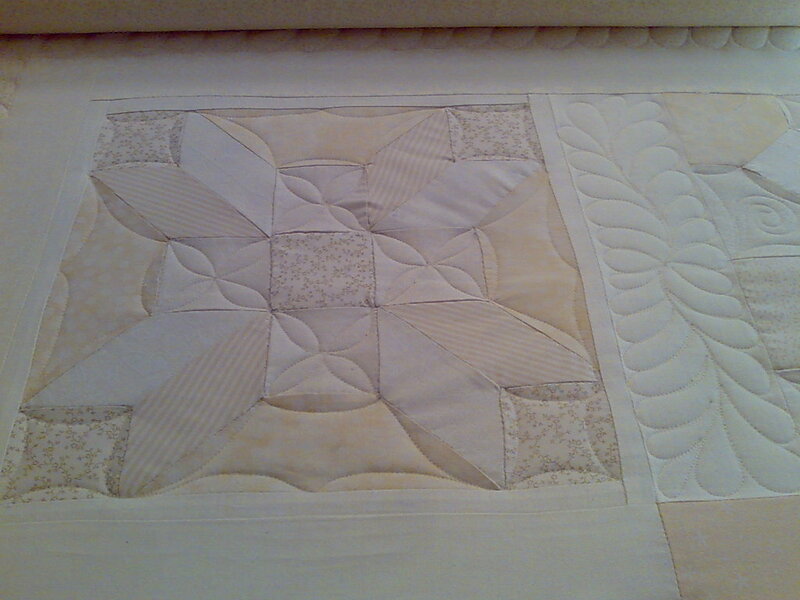 It's been good to be back quilting properly after such a long break. I am now desperate to get my customers quilts done ASAP. This particular quilt is a sample for Patchwork Corner, and I suspect will be on disply at Quilts UK Malvern in just over a week. I really loved working on this quilt, although I wasn't sure what Jenny was going to think of it. It is very different to most of the quilts I have done for her, much more me. I was very relieved to find she did indeed like it and has laready started putting the binding on. The other quilt I tried to post a picture of wasn't quite so sucessful. Jenny wasn't sure about it. She doesn't dislike it but it wasn't really working either. It turns out to be the colour of the thread I used. She had wondered if it was the design (a new all over I was working on) but having seen it on another quilt I returned today realised she does like the pattern. It's very hard to get the thread right every time. I am not too concerned, it's a sample and she isn't that unhappy with it, but it does hilight the need talk over every detail of important quilts with your longarmer. In particular I like to know about dislikes. If there are things I have to avoid it helps to know. 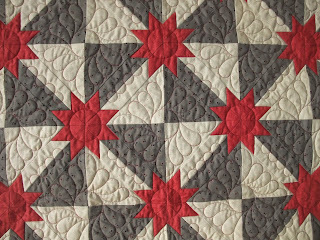 For example I know Jenny likes the quilting thread to blend with the quilt, and if in doubt head for grey or brown. I have other customers who like loud thread so they can see what they have paid for :) If I don't know which sort of person I am dealing with there is a lot of scope for error. Fortunately today I had plenty of happy people and I managed to make a start on my Rhapsody quilt. I've finished the quilt on the frame and now it's time for Rockband. Yes I'm sad. So sue me. After my last post I got a package. The ash cloud that stopped flights held up a lot of post as well as people. I was waiting on my fabric for my rhapsody quilt. Starr fabrics had sent it just before the volcano, it arrived today. It's lovely and I will be able to start it nect Wednesday before my student's get too far ahead. After deciding it was too hard and they would just watch me make one, they decided it looked fun. So now there are a group of us working on them. I am really looking forward to it. Of course. Being me, I have broken or adjusted all the rules, but I think it will still work. It will be a bit harder than Ricky intended though. Today didn't pan out quite the way I expected but it's been fun, and that's what counts right? So I can finally reveal the great little video/slideshow that Mary at the quilt show put together for me. I am absolutely thrilled with it, and especially as it came up today. What a birthday present. If you would llike to have a look at it, you can find it here. She did a good job didn't she, and all without actually meeting me. I think their team is getting very good a t connecting with quilters all over the world making full use of the internet and post. I had been planning on going out today to make sure I didn't end up working. I know if I hang around the house that tends to happen as I get bored when I'm not quilting, but with the tube network largely shut and the weather not looking great we weren't coming up with anything fantastic to do. It turns out my presents held a solution though, I'm going to play Rockband today. We go and visit friends pretty often to play and I love it, but I've been wanting to learn the drums for a while. You can't really do that with the ocassional sessions, but now I have my own set at home I can now learn. It is going to be a tight fit as they need to be in the room my longarm lives in, so we may have to get some shelving in which will make my working life easier too. However, I've just decided that breakfast might be a good idea, so we will head off to the Ace cafe and make them feed us. I've just been advised on Facebook I should do thinks I shouldn't because I can and well, a large fried breakfast seems like a good starting point.